I had, as I often do, a Twitter conversation today. I was rushed, and unable to fully articulate what I wanted to say either in the short time I had, or in the 140 character limit so unique to texting and Twitter. 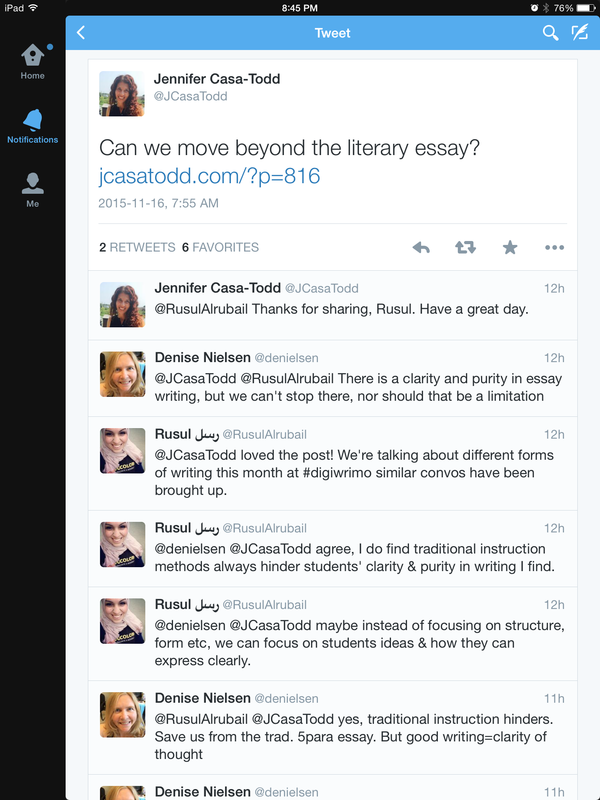 Can we move beyond the literary essay? Jennifer Casa-Todd’s question sparked a number of thoughts. 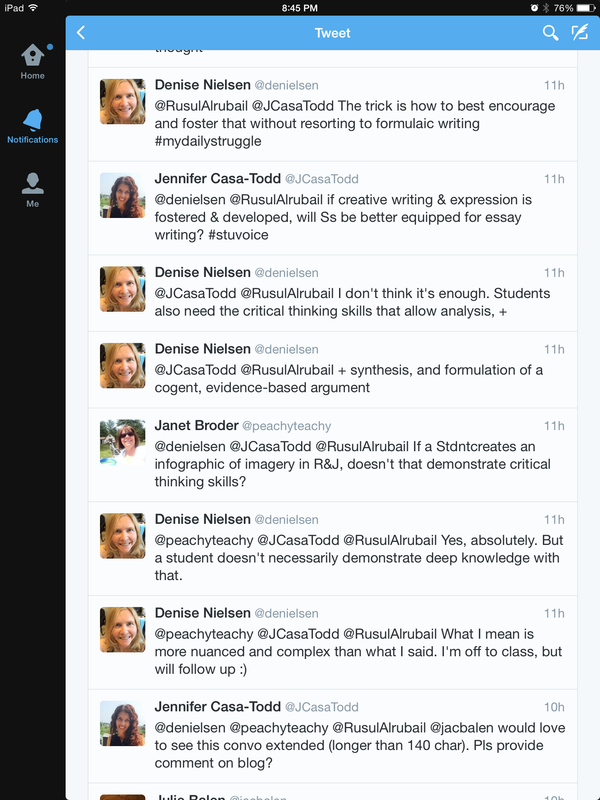 I’ve included screenshots of the conversation below, but I feel we all saw the merits of writing as being a way to clarify our thinking, while simultaneously understanding that the traditional forms of writing are not always working for students. I can only speak for myself when I wince at the five paragraph structure which I see as formulaic and, thus, inauthentic. I spend an inordinate amount of time encouraging college students to develop their own voice and style in writing, and this is made difficult by a reluctance -generally- to part ways with structured writing that has served them throughout their writing careers. Rusul Alrubail…whose writing is fresh and authentic…chimed in with wise words about focusing on ideas over structure, and Jennifer asked if a return to creative expression is helpful. Yes to both of these. A resounding yes. Here is the “but” that has been trying to creep in since I started this: Creative student writing does lead to a unique voice and an authentic response, however, in my experience, on its own it isn’t enough, and the result is often unfocused writing that rambles without making those clear points that define good writing. Students, I write, also need the critical thinking skills that allow analysis, synthesis (of ideas), and formulation of a cogent, evidence based argument. This is my reality speaking: My college students love opinion. They are great at rhetoric. But they are not so great at supporting their position. I was called on this (and this transparency and discussion is truly why I love Twitter) by Janet Broder who asked if a student-created infographic of imagery in Romeo and Juliet did not demonstrate evidence of deep thinking? This is where I ran out of time and was unable to do justice to the conversation. So here, in a nutshell, is my more nuanced and complex answer to that. An infographic, or any creative project (and I use many varieties of digital projects as culminating activities) can absolutely demonstrate the kinds of critical thinking, analysis, and synthesis that demonstrate deeper understanding, and by remixing, students can repurpose information for multiple audiences thus moving to the higher levels of Bloom’s taxonomy. Having said that though, I am a mother of high school kids and I know just how easy it is to do a digital or multi-media project without any in-depth learning or knowledge of a subject. The ease of the Internet means a savvy teen can skim the surface of any topic and create something that looks impressive but is superficial and does not demonstrate the deeper learning and critical thought process of a truly engaged learner. I’ve seen it. More than ever, there is no need to read the book or poem or play, or to understand the historical significance of an event. Wikipedia is there to do that. What we need then is a reimagining of assignments. And I think….to return to the start of this discussion….that starts with the research and the inquiry, involves writing that is ideally both evidence-based and creatively authentic, and only then, armed with the depth of knowledge and understanding, can the infographic, video, podcast, Twitter-broadcast, or presentation be created. This post itself…an in depth discussion of ideas that could not be captured or done justice to in a series of tweets…is exactly why we need both.